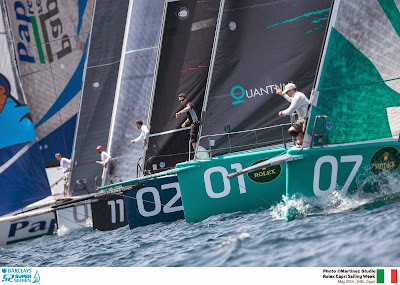 TP 52 Super Series : Will the underdogs have their day? 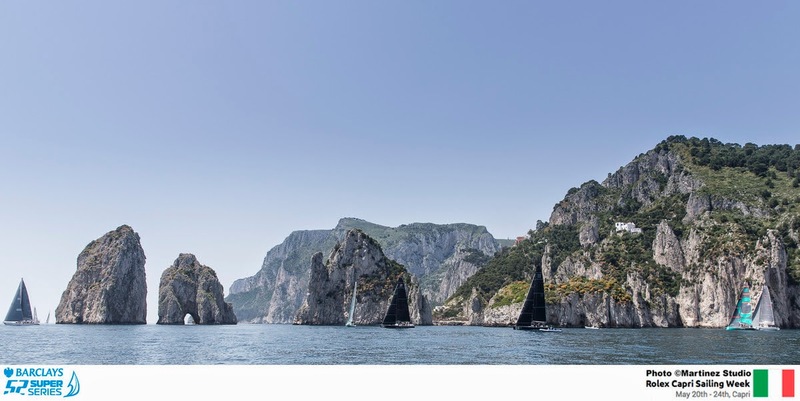 There was no further racing today for the BARCLAYS 52 SUPER SERIES fleet in Capri due to the lack of a settled, suitable breeze. But on the strength of a promising outlook for Saturday, the scheduled final day, the race officers have moved the start time forward by one hour (to 1100hrs local warning) and will attempt to squeeze in as many windward-leeward contests as possible. On the fourth and penultimate day at the Delta Lloyd Regatta the schedules took a battering with very light wind and passing rain clouds causing all starts to be postponed from around 11.00 onwards. Only the 49ers, Skud and Sonar classes got in a single race in the morning before all fleets were sent ashore to wait until the wind returned. Postponement followed postponement, with eventually the 49ers called off for the day so they could prepare for their medal race at 18.00. The Nacras were sent out early afternoon, and then the Lasers for a second time, but to no avail and these classes were later abandoned for the day, as well as the two 470 classes, the Kites and the Moths. As the evening approached, finally the skies cleared and a stable wind was recorded on the course areas and the Finn, the RS:X and the Paralympic classes were sent out for starts at 18.00. Against all the odd the wind increased to 9-10 knots by start time and was near perfect for racing, albeit late in the day. 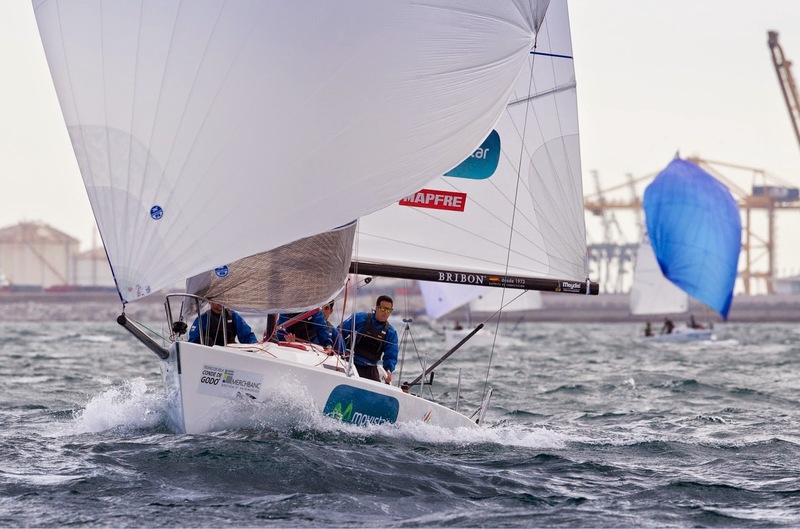 The RS:X fleets managed two races, with Pawel Tarnowski (POL) tied at the top of the men's with Louis Giard (FRA), and Zofia Klepacka (POL) extending her lead in the women's fleet. 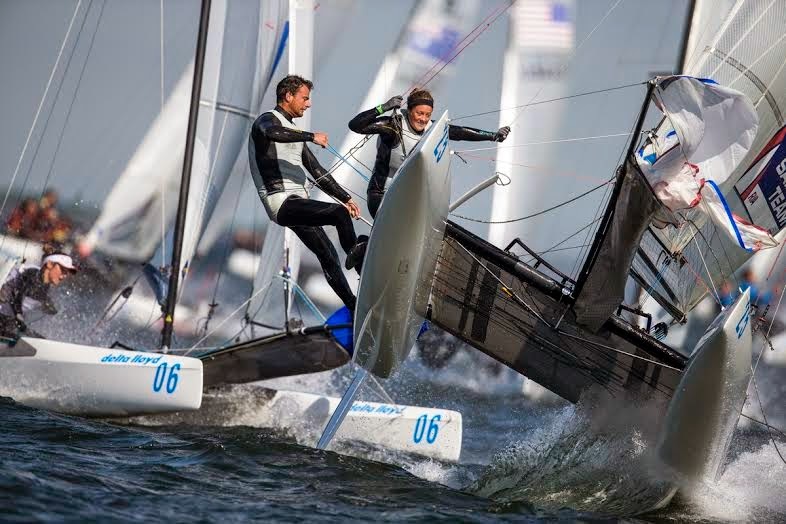 With only one race possible before the wind died, it proved a crucial race with Mads Stephenson Lübeck and Christian Stephenson Lübeck (DEN) leading round for the race win to take a last minute place in the medal race. A second for Dylan Fletcher and Alain Sign (GBR) moved them into the overall lead. After being send ashore when the wind died, further racing was cancelled for the day. The 49er medal races took the form of three short theatre style races just off the harbour mouth. A second for Fletcher and Sign in the first race extended their lead to 11 points, while John Pink and Stuart Bithell (GBR) moved up to second. A win for Jonas Warrer and Peter Lang (DEN) moved them into fourth. Pink and Bithell led the second race with Fletcher and Sign at the back round the first mark. Warrer and Lang rounded second. Pink and Bithell extended away for a big win, with Warrer and Lang crossing in second and Fredericio Alsono and Arturo Alonso (ESP) in third. With third placed Pavle Kostov and Peter Cupac (CRO) back in ninth it meant the gold was heading to Great Britain. Warrer and Lang could still steal bronze with another good race. The Croatian team finally had a good first beat in the third race to round ahead of the other front runners. Erik Heil and Thomas Ploessel (GER) ran away with the race win, with Deigo Botin and Pablo Turrado (ESP) in second, while Kostov and Cupac crossed in third to save the bronze. 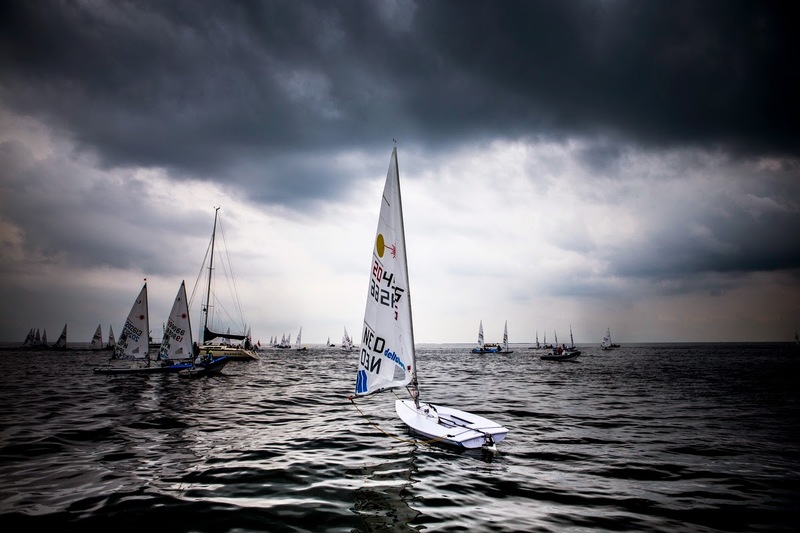 The Nacra fleet was sent out only to wait in the water with no races completed. Saturday's medal race looks like turning into a three way battle between Billy Besson and Marie Riou (FRA), Franck Cammas and Sophie de Turckheim (FRA) and Darren Bundocck and Nina Curtis (AUS). The two French teams are all but guaranteed a medal, while Ben Saxton and Hannah Diamond have an outside chance of claiming bronze but are 15 points adrift of the Australians and need a lot of other things to fall into place to make that possible. With no racing possible for the women's 470 fleet, Michelle Broekhuizen and Marieke Jongens (NED) will go into the medal race with an eight point lead from Afrodite Kyranakou and Anneloes van Veen (NED), who are just three points ahead of Linda Fahrni and Maja Siegenthaler (SUI). The points are so close in this fleet that anyone in the top 10 can win a medal with the tenth place boat only 15 points adrift of bronze. 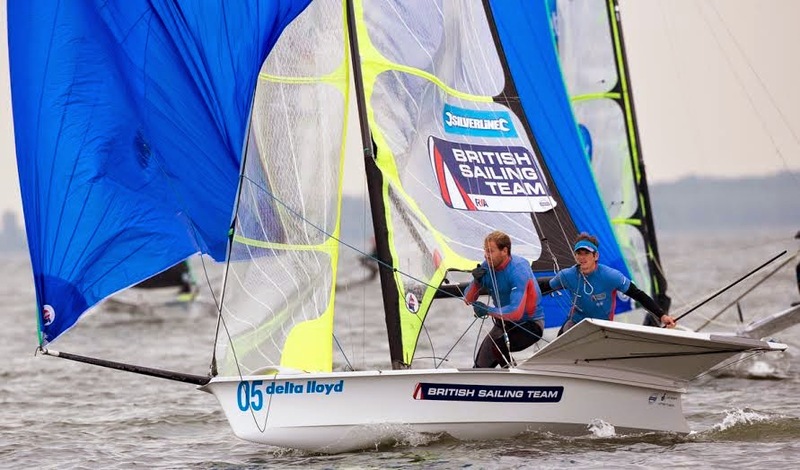 The picture is similar in the men's 470 fleet with only six points separating the top six boats and any boat up to ninth theoretically capable of winning a medal. Onan Barreiros Rodriguez and Juan Curbelo Cabrera (ESP) have a five pint lead over Luke Patience and Elliot Willis (GBR) who are on equal points with Giulio Desiderato and Andrea Trani (ITA). There is everything still to play for in the medal race. Prrzemyslaw Miarcynski (POL) is back into third, but the next three boards are within seven points, so the medal race should be quite exciting for them. Zofia Klepacka (POL) picked up a 2, 1 to extend her lead to 10 points. Malgorzata Bialecka (POL) moves up to second, while Kamila Smektala (POL), who won the first race is in third, but on equal points with Lilian de Geus (NED). The points are not quiet as close as the men's fleet but there are two more sailors within reach of the lower medals. The Finns got just one race in with Pieter-Jan Postma (NED) taking the lead for the first time this week after winning his third race. He overtakes Phillipe Kasueske (GER) who crossed in second, while Jake Lilley (AUS) placed third and sits six points behind the German going into the medal race. The Laser fleet were sent out twice and both times, came in with no racing held. Nicholas Heiner (NED) holds a seven point lead over Sam Meech (NZL), while Andy Malony (NZL) remains in third, though on equal points with Matthew Wearn (AUS) and Thomas Saunders (NZL). Ironically, Heiner is being coached by a Kiwi, Dan Slater (NZL). The Laser Radials had a similar day, but again no racing. However the points are much closer going into Saturday's medal race. Marit Bouwmeester (NED) leads Alicia Cebrian Martinez de Lagos (ESP) by four points and Evi van Acker (BEL) by just seven. Another five boats can win a medal. Last year's bronze medalists here, John Robertson, Hannah Stodel and Steve Thomas (GBR) took their first race win of the week to move into third overall, while Bruno Jourdren, Eric Flageul and Nicolas Vimont-Vicary (FRA) still lead from Colin Harrison, Jon Harris and Russell Boaden (AUS). When they returned to the water at 18.00, Bruno Jourdren, Eric Flageul and Nicolas Vimont-Vicary (FRA) took the race win to lead by seven points, while John Robertson, Hannah Stodel and Steve Thomas (GBR) ended their best day this week with a second to move up to second overall. Colin Harrison, Jon Harris and Russell Boaden (AUS) drop to third. The Skuds got in one race before the the wind disappeared. 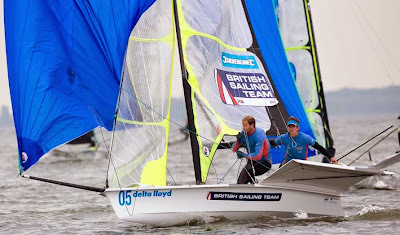 Alexandra Rickham and Niki Burrell (GBR) took control of the race with a fourth win while Thursday's top crew of Marco Gualandris and Marta Zanetti (ITA) could only finish third. Second place went to Sergi Roig Alzamora and Violeta del Reino (ESP). The second race of the day at 18.00 was won by Vera Voorbach and Jan Rein van Essenveld (NED), though the overall lead remained unchanged. Megan Pascoe (GBR) won her fifth race out of seven and is starting to run away with the lead. Matt Bugg (AUS) placed second to move up to second while a tenth for Helena Luca (GBR) dropped her to third. Racing at the Delta Lloyd Regatta concludes Saturday with the final fleet races and the medal races for the top 10 in each class. The first fleet races start from 9.30, while the medal races start with the RS:X men at 11.00. Respectivement 5e et 11e de la seule manche courue hier sur la Le Havre Allmer Cup, Fabien Delahaye et Yoann Richomme ont quitté les pontons du Havre ce matin à l'assaut de la 2e journée. Au programme, beaucoup d'envie malgré un vent mollissant, de la pluie et du courant ! El J80 “Bribon Movistar” ha comenzado con buen pie su andadura el Trofeo Conde Godó Merchbanc y, tras subirse al podio de las pruebas disputadas hoy, la tripulación liderada por Marc de Antonio y Sofía Bertrand se cuelga el oro provisional de la clase J80. El viento no ha fallado en aguas de Barcelona. Con más de 20 nudos del Sur el Comité de Regatas dio el pistoletazo de salida a las dos pruebas del día en las que el “Bribon Movistar” mostró todo su potencial. Hacia las 16:30 horas la imponente flota de J80 escuchaba el bocinazo de salida de la prueba inaugural del Trofeo Conde Godó – Merchbanc. Por delante, un recorrido barlovento-sotavento el “Bribon Movistar” se llevaba de calle. El “Deltastone” de Carlos Martínez y el “Great Sailing” de José María van der Ploeg cruzaban la línea tras los regatistas Movistar. “No hay mejor manera de empezar una regata” comentaba Marc de Antonio, quien a continuación explicaba cómo se había desarrollado esta prueba inaugural: “Hemos estado siempre en el grupo de cabeza y en la última popa hemos navegado bien y finalmente entramos primeros”. El Comité de Regatas aprovechó las buenas condiciones en aguas del Mediterráneo para dar el bocinazo de salida a la segunda y última prueba del día en la que el “Bribon Movistar” volvió a pelear entre los mejores de la prestigiosa cita catalana. “El viento había bajado un poquito y la verdad es que fue una regata muy igualada, con los cuatro primeros intercambiando posiciones. Al final hemos entrado segundos, pero los tres primeros entramos muy pegados” afirmaba De Antonio. En esta ocasión Hugo Rocha se hacía con su primera victoria parcial. Con dos podios en su casillero, el “Bribon Movistar” se coloca líder del Trofeo Conde Godó-Merchbanc. Tras él, y empatados a cinco puntos, el “New Territories” de Hugo Rocha y el “Deltastone” de Carlos Martínez. Mañana sábado la flota de J80 disputará una nueva jornada de competición del Trofeo Conde Godó-Merchbanc. La flota podría escuchar el bocinazo de salida a un total de cuatro mangas por lo que, tal y como señalaba Sofía Bertrand: “La de mañana será una jornada clave y, además, será un día complicado meteorológicamente hablando”. La cita, a partir de las 12:00 horas. The Gazprom Youth Sailing Challenge has announced final selections for the Russian Youth Sailing Team which will be competing on the 2014 Gazprom Swan 60 Class Circuit. Launched in 2013 by Saint Petersburg Yacht Club Russia, the Gazprom Youth Sailing Challenge is a unique programme which works to support young talented sailors from Russia reach an international level in sport. 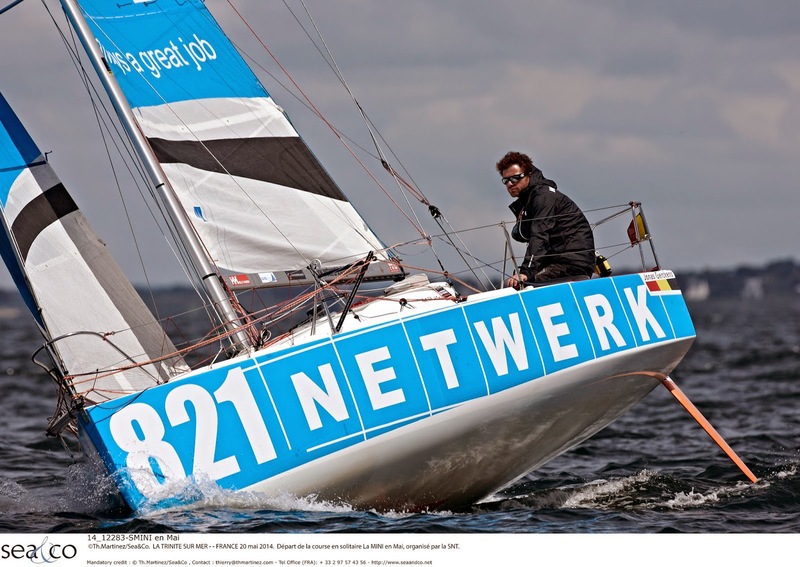 The Swan 60 youths now face their first test as a team with the start of the Nord Stream Race on the 30th May. Over seventy applicants applied and thirty were selected to take part in selection trials at Saint Petersburg during April and May of this year. As well as daily boat handling afloat the candidates had to pass a series of psychological suitability and English tests to qualify for the official Russian Youth Sailing Team. This is the first initiative of its kind to be developed in Russia, providing youngsters with the ability to live their global yacht racing dreams. Mentor and skipper for the 18-30 year olds afloat will be Sergey Borodinov (RUS) who has competed in the Whitbread Round the World Race, Olympic Games and is also a World Cup Champion. “All of the candidates have shown a high level of training and motivation which made our final selection difficult, I am confident that the sailors whom we have invited deserve to be part of the Russian Youth Sailing Team and I look forward to racing with them”. As well as fresh faces to the racing world, Sergey will have the support of Vitaly Rozhkov (RUS) and Alexander Bozhko (RUS) both currently racing on the highly competitive RC44 circuit as Gazprom Youth Sailing Challenge. 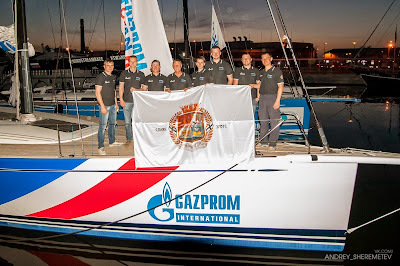 Gazprom Youth Sailing Challenge is a long term initiative likened to the success of the Artemis Offshore Academy and British Keelboat Academy. The sporting talent discovered during this selection process will be developed carefully. After their initial season of Swan 60 yacht racing the youths will be guided by Saint Petersburg Yacht Club in order that they all achieve their sporting ambitions as part of one of the yacht club’s professional teams. After a start on the home waters of the Baltic the team will head to the Mediterranean in order to compete in the Gazprom Swan 60 World Championship and other events. IMOCA New York - Barcelona : New York Here We Come! 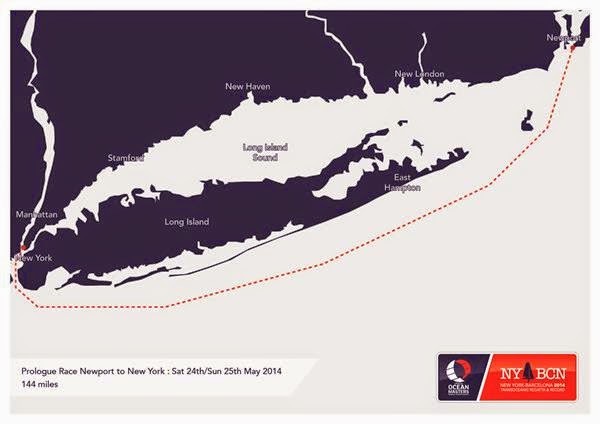 Prologue Race from Newport to New York. Image copyright Ocean Masters. 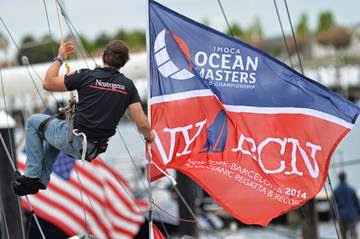 After a great stop-over in Newport, where the teams have been able to carry out all the final preparations after their transatlantic crossings from Europe, the competitors of the IMOCA Ocean Masters New York to Barcelona race head for New York tomorrow at around 1500 hrs local time, for a prologue that could face some tricky weather conditions. « The fleet will start in front of the Fort Adam coastal fortification, with a short course around the Bay of Newport and around two race marks before they leave Long Island to starboard and head directly for New York to reach the finish line just in front of North Cove Marina, in Downtown Manhattan. » explains Jacques Caraes this morning, the Race Director together with Guillaume Evrard. The boats will remain in this marina on display until the start of the transatlantic race on 1st June. The course of 155 miles will be raced in a wind that looks like it will drop fairly quickly after the start, possibly to the point of disappearing altogether in the heart of the night. "I think the beginning of the Prologue Race will be the most interesting part, since the competitors should be able to get out of Newport with a favorable current and a decent breeze but that will disappear during the night ….which means it could take them some time to reach the Verrezzano Bridge, " explaines Jacques Caraës. 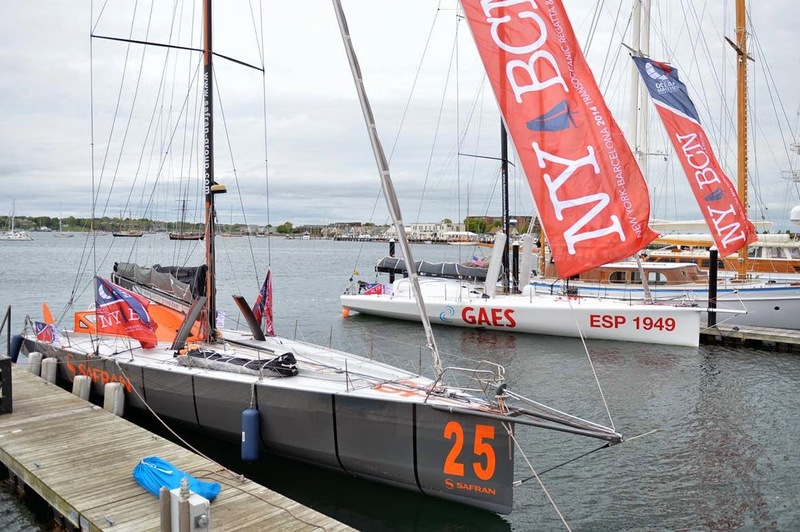 Under the suspension bridge which links the boroughs of Brooklyn with Staten Island, the IMOCA 60s are expected by late morning to finish their course as they parade through the heart of New York. A vision that puts a smile on the face of Spaniard Guillermo Altadill , co- skipper of Neutrogena together with Chilean Jose Munoz . explorations by sea through to race record attempts and the arrivals and departures of big races ... and the Statue of Liberty that greets skippers as they pass it is a beautiful symbol ! " . For Morgan Lagravière, (whose 27th birthday is today!) and who happily just completed his first transatlantic when delivering Safran from Lorient to Newport, the prologue promises to be another opportunity to review in more detail the operation of an IMOCA 60 but also to continue to have fun before the start of the IMOCA Ocean Masters New York to Barcelona Race. "I view this as a nice prologue race from the human perspective first because we are going to be quite a few people on board , including my big brother who have comehere specially from Canada where he lives ... but that will not prevent us from trying go faster than the others! And then we have the chance to enjoy again the beautiful environment that surrounds us. I was very taken by Newport ... but I'm also looking forward to enter New York City by sea." Hugo Boss, which is still waiting for a delivery from Sri Lanka, that is currently stuck in Abu Dhabi, is due to re-step their mast late afternoon tomorrow, and then hopes to test sail the next day and then rush to New York for the start of the big race on 1st June. 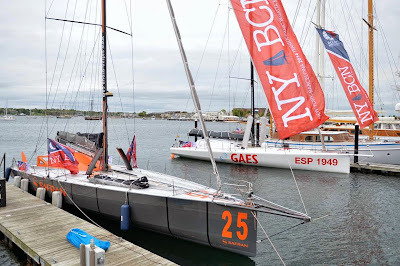 Hungarians Nandor Fa and Marcell Goszleth (Spirit of Hungary) are continuing their voyage across the Atlantic and making good progress and they are expected in New York on May 29th. On June 8, Gwénolé Gahinet will start his first Solitaire du Figaro - Eric Bompard Cachemire at the helm of Safran-Guy Cotten. By winning the two-handed Transat AG2R La Mondiale, the young sailor made ​​a grand entrance onto the Figaro Bénéteau circuit and is ready and looking forward to competing in this legendary race that his father, Gilles Gahinet, won twice in 1977 and 1980. 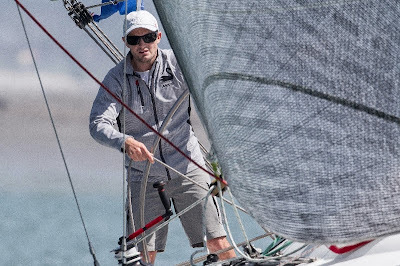 Currently in Le Havre for the Le Havre Allmer Cup, the first round of the Championship of France Elite for solo offshore sailing, Gahinet has an appointment in 16 days for the starting gun in Deauville. With 40 of the best Figaristes of the moment on the startline, La Solitaire du Figaro has been the flagship event of the circuit for 44 years. It is a coming of age that Gahinet is eagerly awaiting. "I have been thinking about La Solitaire for a long time, but just being there has never been the whole dream, it is not an end in itself,” Gahinet said. “As a sailor, I'm keen to start this adventure. Confronting myself and maybe pushing my limits are exciting prospects." Confident after three weeks of racing in the Transat AG2R La Mondiale, the skipper of Safran - Guy Cotten, knows that despite all that, the really hard work is to come. "With fine-tuning and steering the boat, I’ve improved, but I still have many things to discover,” Gahinet said. “I haven’t set myself a specific finishing place, I just want to continue to do things as well on the transat. That was fairly successful us. I am coming with no fear, I just want to do my best." The most difficult solo race? 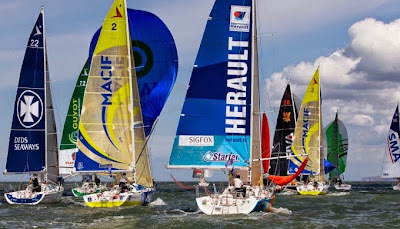 After six days of racing on Le Havre Allmer Cup, Gahinet and the other competitors will leave Le Havre in a parade on May 29 and head to Deauville, the starting town for the 45th edition of La Solitaire. 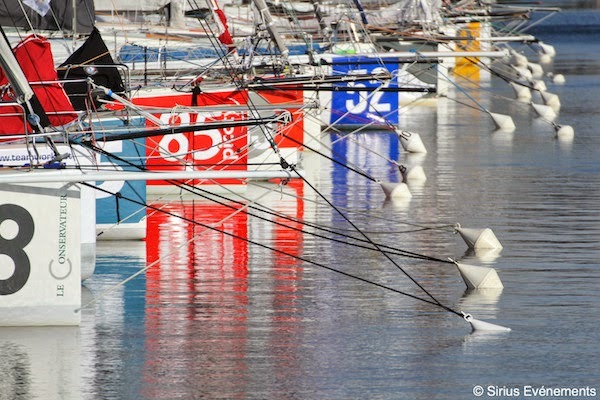 From May 31, all the boats will enter Seine Bay for the Prologue Eric Bompard Cachemire. Then there will be a week for Gahinet and his team to make the final preparations: victualling, measuring and weather routing. Join us on Sunday, June 8 at 13h for the start of the first leg, Deauville - Plymouth (England). Le navigateur dunkerquois prendra le départ, dimanche, de la Normandy Channel Race, course hauturière de 1000 milles de Caen à Caen en passant par les îles Sain-Marcouf, l’île de Wight, Tuskar Rock, le Fastnet et Guernesey. 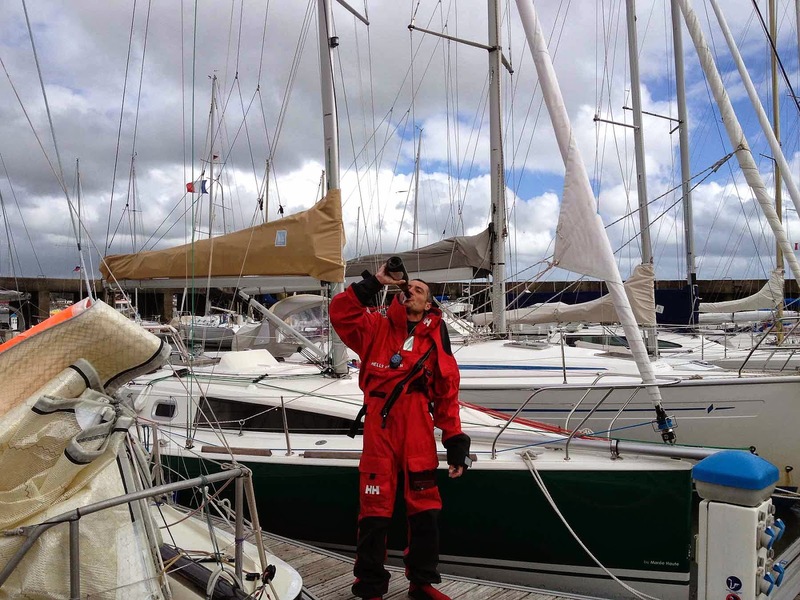 Thomas Ruyant épaulera Pierre-Yves Lautrou, skipper du nouveau Class 40 L’Express – Trepia. Thomas connaît bien la Normandy Channel Race. Il a remporté la première édition avec Tanguy Leglatin en 2010. Cette année, un plateau de grande qualité est au rendez-vous avec de nombreux tandems capables de couper la ligne d’arrivée en tête comme Mabire / Merron, Rogues / Delahaye, Bestaven / Brasseur. « C’est vrai que la concurrence sera élevée » indique Thomas en pleine préparation du nouveau Class 40 Pogo S3. Thomas Ruyant est toujours à la recherche de partenaires afin de prendre le départ de la prochaine Route du Rhum, course qu’il a remportée en 2010 en Class 40. Il rêve également toujours de s’aligner au départ du Vendée Globe 2016. Australian match racer Keith Swinton has been knocking on the door of greatness since he first joined the Alpari World Match Racing Tour in 2012. With a new sponsorship from FX broker Alpari, we catch up with Keith to see if the new funding will give the Aussie team the extra momentum to challenge for the world title this year. Keith Swinton and crew are the new Team Alpari FX. 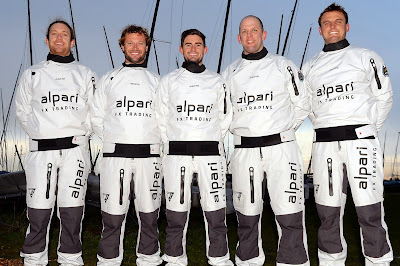 Following the move by last years Alpari FX skipper Adam Minoprio to the Italian America’s Cup Challenger Luna Rossa (Minoprio could well make an appearance in Francesco Bruni’s Luna Rossa crew on the Tour this year), 28-year-old Swinton from Perth has now taken over as the jockey for title sponsor Alpari. After finishing 4th and 6th in the previous two seasons of the World Tour, Swinton hopes the extra support from Alpari will give him the momentum to make it on to the podium by the end of 2014. With only two weeks away to the Alpari World Match Racing Tour season opener Match Race Germany, Swinton is marking Sweden and Chicago as his favourite venues on the Tour. Swinton currently lives with his Swedish girlfriend just down the road from Marstrand, 50kms northwest of Gothenburg. Marstrand is the venue of the renowned Stena Match Cup Sweden, a flagship event of the World Tour and where nearly all of the world’s top match racers have competed including Russell Coutts, Peter Gilmour, Ed Baird, Dean Barker, Magnus Holmberg to name a few. Swinton is most comfortable racing in the smaller, lighter boats, but knows the key to success is being able to adapt to any kind of boat, one of the unique challenges of the Alpari World Match Racing Tour. “We are slowly building confidence in the heavier boats, and we did well in the Catalina 37’s at the Congressional Cup for example, having never sailed the boats before against a lot of guys who have done more time in the boats. So we are certainly improving all the time. It has been a weakness, but we've been working on it hard, so hopefully it's going to become a more of a strength this year." The other key to success on the Tour is a consistent team. Although he’s sad not to be able to secure the services of former crew man Kyle Langford, wing trimmer on board the Team Oracle USA AC72 in last year’s America’s Cup, Swinton is very happy with his new signing. “At the beginning of the year we were hoping Kyle would join us for some of the events, but we have signed on a new tactician, Ben Lamb, who will be with us all season. The 2014 championship gets underway at Match Race Germany on 5 June. 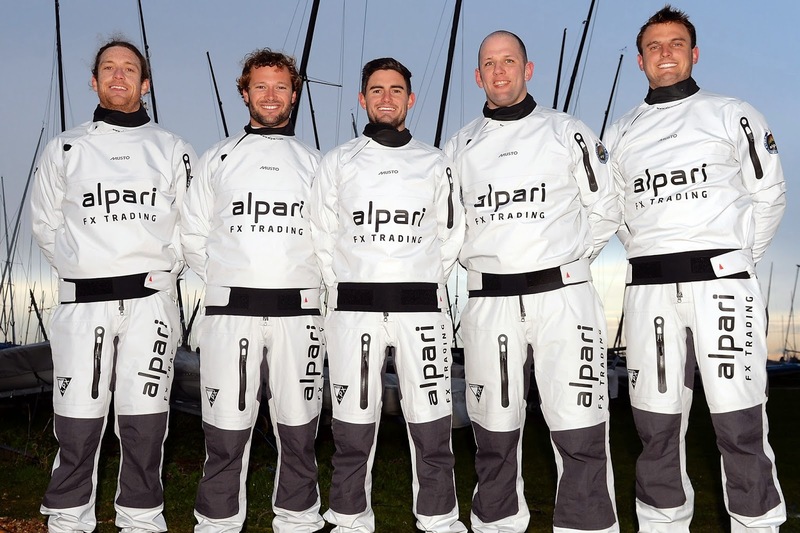 The Alpari World Match Racing Tour is one of five special events sanctioned under the International Sailing Federation (ISAF) including America's Cup, the Volvo Ocean Race, the Extreme Sailing Series and the PWA World Tour. Just 48 hours remain until the 17 CLASS40s competing in the Normandy Channel Race take the start! We give you the low-down on the opposing armies! Raring to go, the thirty-four skippers will have to sit it out for a further two days prior to knocking their boats into shape in the English Channel and then the Celtic Sea. Considered to be a tough event, racers compare the Normandy Channel Race to a cycle race consisting only of mountain passes! Yannick Bestaven, winner of the Transat Jacques Vabre in 2011 and 4th in 2013, is sailing with none other than last year’s winner of the event, Pierre Brasseur, aboard the Class40 LE CONSERVATEUR in her brand new livery. “I haven’t yet had the opportunity to add the Normandy Channel Race to my list of accomplishments and, as usual, I make no secret of the fact that I’ll be heading out with some not so secret great ambitions,” he admits. Bertrand Delesne and David Raison (winner of the Mini Transat 2011), two experienced mini sailors, will be competing aboard TEAM WORK. Eager to get going, this will be their first life-size confrontation against the rest of the fleet of 40 footers. 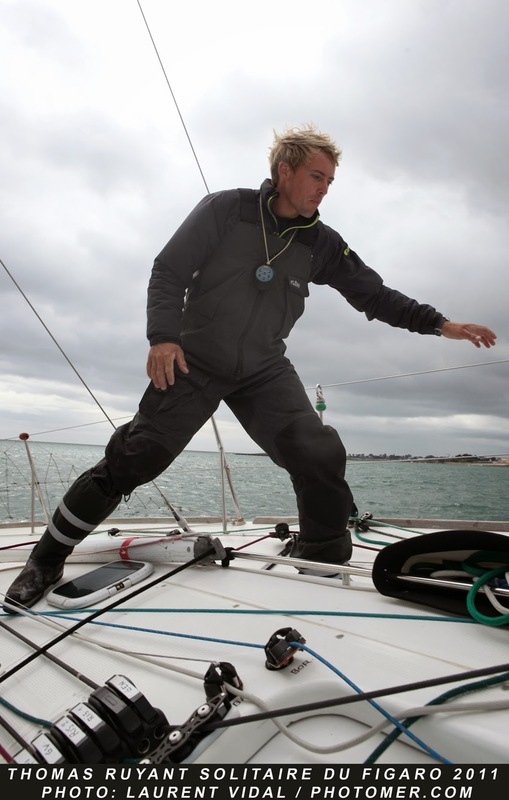 Former Olympic champion Jean Galfione, skipper of TEAM SERENIS CONSULTING, will be teaming up with an exceptional sailor, who needs no introduction: Roland Jourdain, double Route du Rhum champion in 2006 and 2010 with a plethora of other renowned races to his credit… Objective: to be in the top 5! Competing for the 3rd time, Sébastien Rogues, winner of the last Transat Jacques Vabre and Class40 2013 champion, will naturally be part of proceedings on GDF SUEZ. He will be accompanied by Bertrand Castelnerac, who also boasts a formidable track record. Competing in their first double-handed race of the season on a boat built in 2013, the duo very much hopes to secure a podium spot. 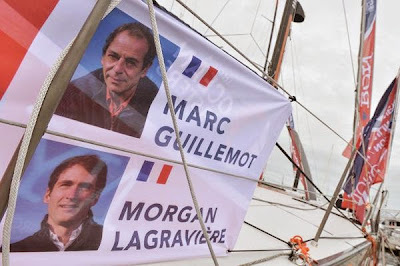 CAMPAGNE DE FRANCE wouldn’t let a Normandy Channel Race go by without her and she’ll be skippered by the now famous Franco-British couple, Halvard Mabire and Miranda Merron. “This race is an event that is dear to us given our respective pedigrees, Anglo-Norman to be specific. 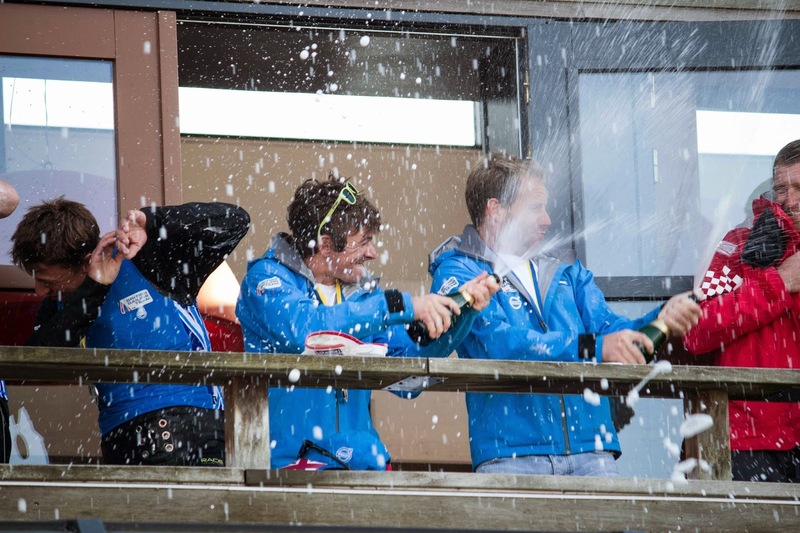 We hope to make the podium once again, but the standard of the Class40 is continually progressing”. The Class40 ERDF – Des Pieds et des Mains will also be helmed by a mixed duo, this one comprising Damien Seguin and the talented Figaro sailor Jeanne Grégoire. “To discover the Class40 circuit alongside a high performance skipper, who knows his boat inside out is a fantastic opportunity. It’s also excellent training for the Route du Rhum, which he covets. The podium is clearly a target,” says Jeanne. 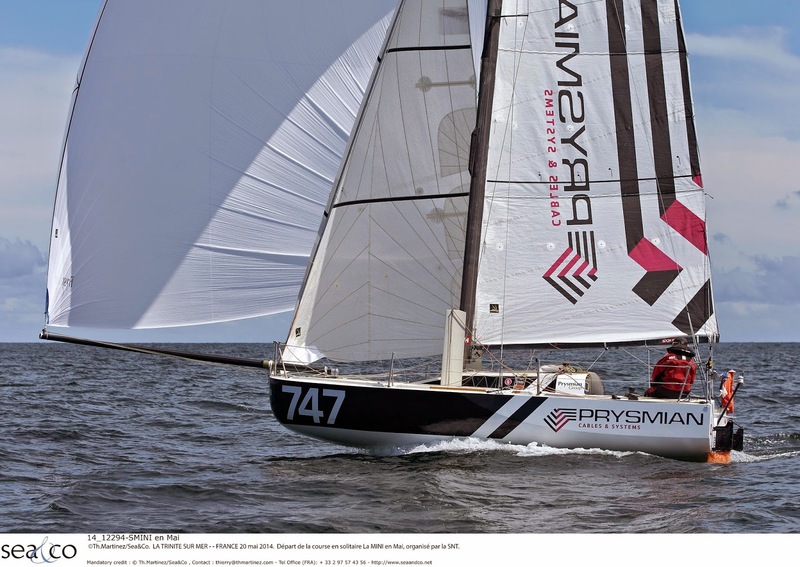 Jean-Christophe Caso and Aymeric Chappellier on TEAM PICOTY – LAC DE VASSIVIERES are back after their first Normandy Channel Race and a 5th position in the Transat Jacques Vabre in 2013. They won’t be standing on ceremony in their bid to vie with this year’s firm favourites! Pierre-Yves Lautrou is sailing with Thomas Ruyant, winner of the 1st edition as well as the Route du Rhum 2010 and the Mini Transat 2009. 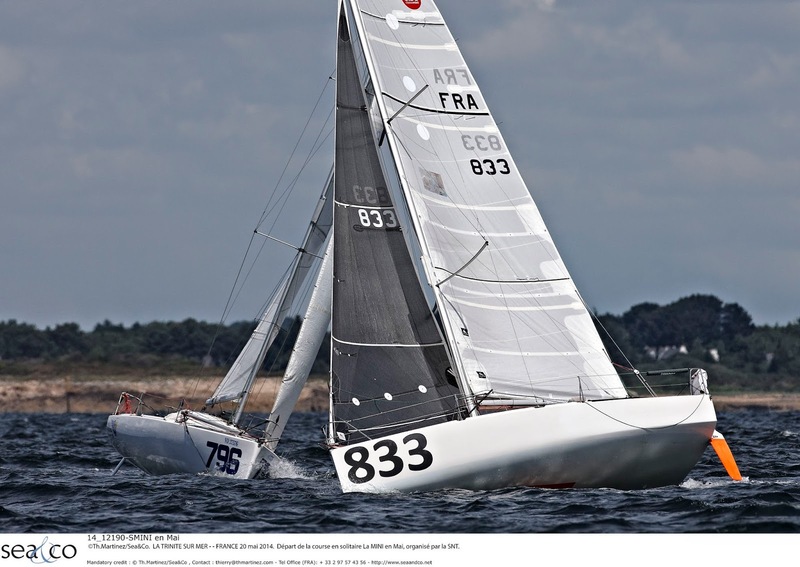 Together they’ll be racing on L’EXPRESS - TREPIA, the class’ most recent addition and a Finot/ Conq 2014 design. Making the boat reliable and racking up experience with a view to the upcoming Route du Rhum is Pierre-Yves’ primary focus. 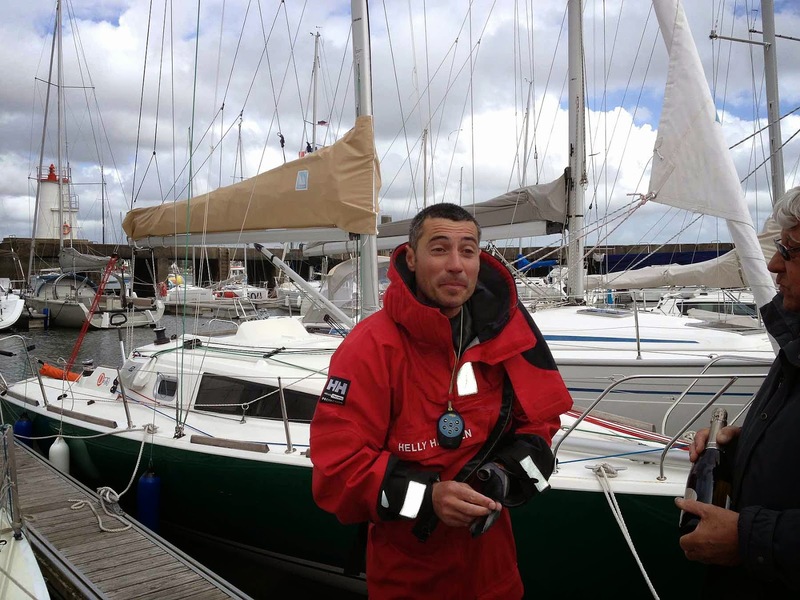 A native of Lower Normandy, Louis Duc is bringing along a highly enthusiastic sailor and seasoned accident and emergency doctor, Damien Rousseau on ADVANCED ENERGIES – Carac. The plan is to rack up the race miles and continue to develop the boat with a view to the Route du Rhum/ Destination Guadeloupe. Brieuc Maisonneuve, company director, has chosen a Belgian with experience in the Class40 and the Mini class to “beat Halvard Mabire” he says gleefully. Rémi Aubrun, master sailmaker, is very much hoping to help Brieuc succeed in his ambitious challenge aboard the Lombard design GROUPEMENT FLO. Aboard KOGANE, the 59-year old Franco-British duo wants to appreciate the sea and sailing as well as outdo the youngsters! 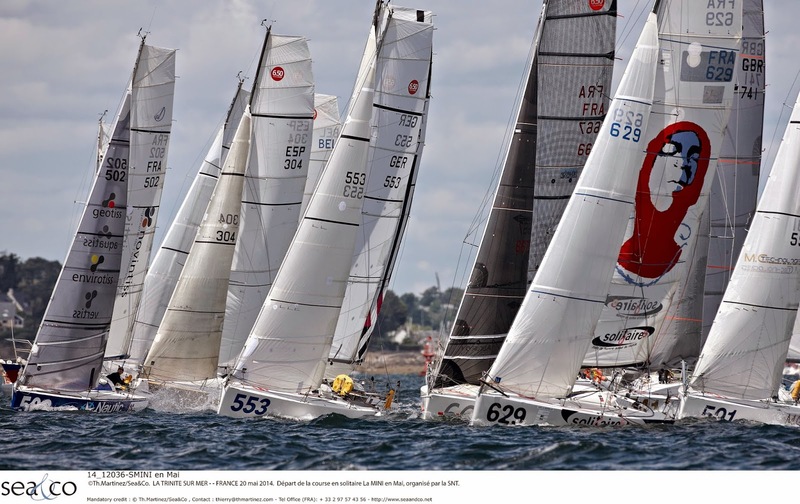 Patrice Bougard and Richard Tolkien are hoping to prove that an amateur crew bordering on their sixties is capable of battling it out for an honourable place. Ah LA BELLE EQUIPE 2! The boat may not be the youngest of the Normandy Channel Race 2014 fleet but one of her crew is! At 26 years of age, Loïc Coudret is getting some miles under his belt in readiness for the Mini Transat 2015. He’ll be alongside Bruno Rzetelny, 58, whose aim is to continue preparing the boat and take up the challenge to be in the top 10 of this edition! Another duo with a few years between them, Maxime Sorel, 27, and Pascal Quintin, 54, both highly experienced Multi50 sailors, will be competing in their first Normandy Channel Race aboard MS-SAILING TEAM. 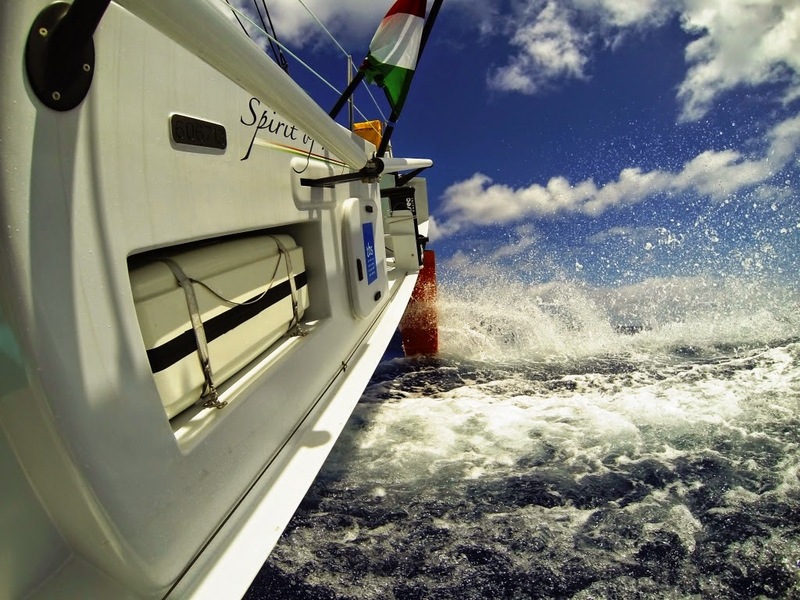 In Maxime’s line of sight is the Route du Rhum/ Destination Guadeloupe! The Lorraine-based sailors are back again this year on OBPORTUS 3! Olivier Roussey and Philippe Burger are seemingly stuck to one another: “After two years finding their way around the Class40 and a Transat Jacques Vabre full of lessons, the Normandy Channel Race is an opportunity to extend the adventure and battle it out with the most seasoned crews!” explains Olivier. ROMERIKE ELEKTRO AS as “a new boat isn’t everything in the Normandy Channel Race, strategy prevails!” according to Rune. Finally, this isn’t the first attempt for Paul Peggs and Roderick Knowles on SWISH either, but this time they hope to complete the race in a good position, whilst learning some tricks and having fun along the way! There’s no doubt that the quality of this line-up bodes well for some fine battles in the English Channel and the Celtic Sea! See you on Sunday 25 May at 1400 hours local time when hostilities commence! In French: A deux jours du départ ! Encore 48 heures avant que les étraves des 17 CLASS40 inscrits cette année ne passent la ligne de départ de la Normandy Channel Race! Passage en revue des forces en présence! Trente quatre skippers prêts à en découdre vont devoir patienter encore deux jours avant de dégourdir les coques de leur monture en Manche puis sur la mer celtique. Considérée comme une épreuve difficile, les coureurs comparent la Normandy Channel Race à un tour cycliste où il n’y aurait que des cols ! Yannick Bestaven, vainqueur de la Transat Jacques Vabre en 2011 et 4ème en 2013, embarque avec lui le vainqueur de la dernière édition, Pierre Brasseur, à bord du Class40 LE CONSERVATEUR. « Je n’ai pas encore eu l’occasion d’accrocher à mon palmarès la Normandy Channel Race, comme d’habitude, je pars avec de grandes ambitions secrètes » confie-t-il. Bertrand Delesne et David Raison (vainqueur de la Mini Transat 2011), deux ministes chevronnés, seront ensemble sur TEAM WORK. Pressés de partir, ce sera leur première confrontation grandeur nature avec le reste de la flotte des 40 pieds. 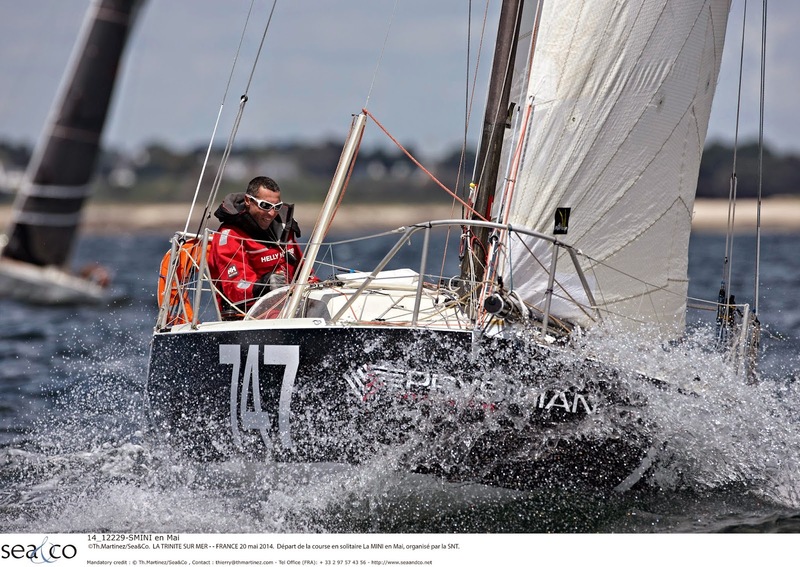 L’ex-perchiste champion olympique Jean Galfione, skipper de TEAM SERENIS CONSULTING sera avec un marin d’exception que l’on ne présente plus : Roland Jourdain, double vainqueur de la Route du Rhum 2006 et 2010 et de nombreuses autres courses de renom… Objectif : être dans 5 premiers ! 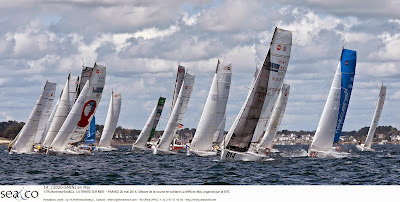 Bien entendu et pour la 3ème fois, Sébastien Rogues, vainqueur de la dernière Transat Jacques Vabre et champion 2013 en Class40, sera de la partie sur GDF SUEZ, accompagné de Bertrand Castelnerac au palmarès également bien fourni. 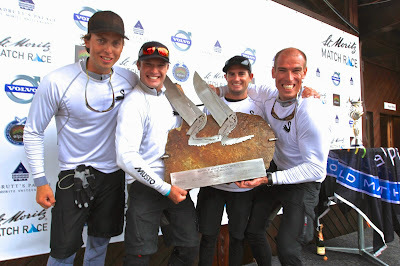 Première course en double de la saison sur un bateau construit en 2013, le duo compte bien monter sur le podium. CAMPAGNE DE FRANCE ne laisserait pour rien au monde une Normandy Channel Race se passer de lui et aura à son bord le désormais célèbre couple franco-britannique Halvard Mabire et Miranda Merron. « Cette course est une épreuve qui nous tient à cœur compte tenu de nos pédigrées respectifs, anglo-normand en l’occurrence. Nous espérons monter une nouvelle fois sur le podium mais le niveau au sein de la Class40 ne cesse de progresser ». Le Class40 ERDF – Des Pieds et des Mains aura lui aussi un duo mixte à sa barre avec Damien Seguin et la talentueuse figariste Jeanne Grégoire. « Découvrir le circuit des Class40 aux côtés d’un skipper performant qui connaît son bateau est une superbe opportunité. Et qui plus est un excellent entraînement pour la Route du Rhum qu’il convoite. Le podium est clairement en ligne de mire » annonce Jeanne. Jean-Christophe Caso et Aymeric Chappellier sur TEAM PICOTY – LAC DE VASSIVIERES remettent le couvert ensemble après une première Normandy Channel Race et une 5ème position à la Transat Jacques Vabre en 2013. Ils ne se gêneront pas pour jouer aux grands favoris cette année! Pierre-Yves Lautrou embarque Thomas Ruyant, vainqueur de la 1ére édition et accessoirement de la Route du Rhum 2010 et de la Mini Transat 2009 sur L’EXPRESS - TREPIA , dernier né de la classe, plan Finot/ Conq 2014. Fiabiliser le bateau et engranger de l’expérience dans la perspective de la prochaine Route du Rhum sont les leitmotive de Pierre-Yves. L’enfant du pays bas-normand, Louis Duc, emmène à ses côtés le plus passionné et aguerri des médecins urgentistes, Damien Rousseau, sur ADVANCED ENERGIES – Carac afin de cumuler les milles en courses et continuer à faire évoluer le bateau en vue de la Route du Rhum/ Destination Guadeloupe. Brieuc Maisonneuve, chef d’entreprise, à choisi un belge expérimenté en Class40 et mini pour « battre Halvard Mabire » comme il se plaît à le déclarer. Rémi Aubrun, maître voilier, embarque donc sur le plan Lombard GROUPEMENT FLO et espère bien aider Brieuc à réussir son ambitieux challenge. A bord de KOGANE, le duo franco-britannique de 59 ans veut apprécier la mer et la navigation ainsi que battre les plus jeunes ! Patrice Bougard et Richard Tolkien prouveront qu’un équipage d’amateurs presque sexagénaires est capable de lutter pour une place honorable. Ah LA BELLE EQUIPE 2 ! Le bateau n’est peut être pas le plus jeune de la Normandy Channel Race 2014 mais l’un de ses marins si ! A 26 ans, Loïc Coudret engrange les milles en vue de la Mini Transat 2015 aux côtés de Bruno Rzetelny, 58 ans, qui a pour ambition de continuer à préparer le bateau et relever le challenge d’être dans le top 10 de cette édition ! Autre duo que quelques années séparent, Maxime Sorel, 27 ans, et Pascal Quintin, 54 ans, tout deux très expérimentés en Multi50, vont effectuer leur première Normandy Channel Race à bord de MS-SAILING TEAM. En ligne de mire pour Maxime : la Route du Rhum/ Destination Guadeloupe ! Les lorrains sont de retour cette année encore sur OBPORTUS 3 ! Olivier Roussey et Philippe Burger ne se quittent plus : « Après deux années de découverte de la Class40 et une Transat Jacques Vabre riche d’enseignement, la Normandy Channel Race est l’occasion de prolonger l’aventure et nous pensons être de la bagarre avec des équipages plus aguerris ! » déclare Olivier. Seconde Normandy Channel Race aussi pour le duo norvégien Rune Aasberg et Simen Lovgren. Les vikings de la course comptent bien finir dans le top 5 avec leur plan Owen Clarke de 2006 ROMERIKE ELEKTRO AS car « un bateau neuf ne fait pas tout sur la NCR, la stratégie primera ! » déclare Rune. Enfin, Paul Peggs et Roderick Knowles sur SWISH n’en sont pas à leur premier essai non plus mais souhaitent cette fois terminer la course en bonne position tout en apprenant des nouvelles combines et en se faisant plaisir ! Nul doute que la qualité de ce plateau promet donc de belles batailles en Manche et mer Celtique ! Rendez-vous dimanche 25 mai à 14h pour le début des hostilités ! Damien Cloarec (www.damien-cloarec.fr - 833) a coupé la ligne en vainqueur, en bateaux de série, 14 minutes devant son dauphin Jonas Gerkens (Netwerk - 821) et 53 minutes devant le 3è, Henri Marcelet (Yakamoz – 737). Depuis le départ 60 heures plus tôt, ils ne se sont pas lâchés, c’est dire si la bataille fut âpre et intense ! A leur arrivée, ils ne cachaient pas leur plaisir d’avoir bataillé à vue de bout en bout et leur satisfaction d’avoir testé leurs bateaux dans des conditions météo rudes, avec un vent forcissant parfois jusqu'à 50 nœuds dans les grains orageux. Chez les Protos, Jean-Baptiste Daramy (Eki Haizea – 814) a coupé la ligne 3h30 après le vainqueur, Giancarlo Pedote. Le 3è, l’espagnol Fidel Turienzo (Satanas – 304) est arrivé plus de 8 heures derrière, mais il signe là une belle performance pour sa toute première course en solitaire et sa deuxième sur le circuit Mini : prometteur. Pour sa première édition, la Mini en Mai a donné du fil à retordre aux organisateurs et aux skippers. La grande boucle de 500 milles initialement prévue entre la Trinité-sur-mer, la mer d’Iroise, l’estuaire de la Gironde et la baie de Quiberon a du être réduite compte-tenu de conditions météo difficiles. Un parcour de 336 milles a été mis en place entre les Glénan et l'île de Ré. Après une première nuit de petit temps où les régatiers ont passé beaucoup de temps aux réglages fins, la deuxième partie du parcours s'est disputée dans des conditions météo rudes : ténacité, endurance et bonne préparation technique furent notamment les clés du succès des deux vainqueurs : Giancarlo Pedote en Proto et Damien Cloarec en Série. Parmi les 37 concurrents au départ, 10 Proto et 27 Série, dont une bonne partie de bizuths et d'amateurs qui font la richesse de ce circuit, 24 ont abandonné pour des raisons techniques et physiques d'abord mais aussi pour éviter les conditions météo très musclées annoncées. Des choix aussi raisonnables que respectables. Coup très dur pour Patrick Girod (Nescens) qui, après avoir réalisé une très belle course, et alors qu'il était à quelques mètres de la ligne d'arrivée, en 3e position des bateaux de série, sur une petite erreur d'appréciation (une confusion entre le projecteur du bateau comité et une cardinale), le skipper suisse s'est mis sur les cailloux à l'entrée de l'étroite rivière de la Trinité-sur-mer. Son bateau a perdu son bulbe puis sa quille. Ce triste accident ne doit cependant pas masquer la très belle performance de ce jeune régatier qui a réussi à accrocher le sillage de coureurs au large aguerris dans des conditions météo très rudes. « Le parcours de cette course est un tracé qui demande de l’engagement : 500 milles entre Ouessant et l’île de Ré, c’est du large, avec beaucoup de transitions, c’est une épreuve qui est difficile. Avec des conditions météo dures et un parcours réduit, c’est resté une course engagée. Je suis content de la façon dont cela s’est déroulé, de la relation avec les coureurs et avec les autorités. Ca a été un moment très intense, une expérience riche. Il y a eu beaucoup d’abandons et c’est logique, une bonne partie de la flotte est constituée de gens qui régatent pour leur plaisir, là nous savions que ce ne serait pas du tout une partie de plaisir : ils ont eu raison d’arrêter à Belle Ile. C’est tout à fait normal et légitime. L’autre partie de la flotte, ce sont des coureurs qui sont là pour faire de la course au large. Ceux qui n’ont pas cassé ou eu des pépins physiques sont heureux d’avoir bouclé ce parcours, tous affirment avoir appris beaucoup de choses. C’est aussi une épreuve qualificative ... les conditions qu’ils ont rencontrées ici, ils sont susceptibles de les retrouver au large. Je tiens à remercier pour leur confiance et leur soutien, la SNT, la Classe Mini et particulièrement les coureurs qui ont abandonné et qui se sont engagés pour le collectif. Nikki et Jeremy pour le pointage à l'île de Ré, et tous ceux qui ont permis de redresser le bateau de Patrick." Jean-Baptiste Daramy (Eki Haizea – 814) 2e Proto : « Tant que j’étais sur le bateau, ça allait, mais là depuis que je suis à terre c’est comme si j’avais pris un coup de barre à mine sur la tête ! Je s uis moulu ! C’était vraiment fort, surtout sur la fin, il y avait 40 à 45 nœuds dans les claques, avec des vagues qui déferlaient… En ayant beaucoup de vitesse, ça allait. C’était un peu inquiétant quand même, mais ça va. Au passage de l’île de Ré ça allait, on était au portant, la mer était plate, ça glissait bien. Le format de cette course est très sympa. C’est dommage que nous n’ayons pas pu faire le grand tour, mais là, ce n’était pas possible, les bonnes décisions ont été prises. 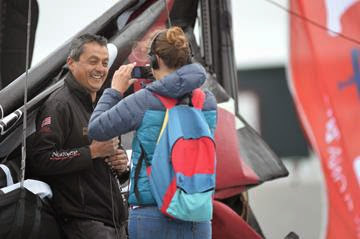 Fidel Turienzo Fuente (Satanas – 304), 3e Proto : « C’était ma première course en solo, ma 2e en Mini, c’est ma première année sur le circuit, je venais pour me qualifier pour Les Sables-Les Açores-Les Sables : une 3e place c’est très très bon ! Et je suis super content d’avoir pu finir la course dans ces conditions. C’était vraiment très dur, le vent était super fort. Patrick Girod (Nescens), abd en Série : « L’atterrissage n’est pas facile, au propre comme au figuré. Ça remet vite les idées en place un coup pareil, trop vite… Je ne suis pas parti en pleine forme et les incertitudes par rapport à la météo ne m’ont pas permis d’être dans un super état d’esprit. Même au passage de Belle Ile, je n’ai pas pu avoir de bulletin précis pour le parcours sur lequel nous partions. Mais jusqu’à Ré, ça allait, j’ai pu me reposer un peu. C’est sur le retour que ça a commencé à être difficile. La mer était tellement dure que ça m’a usé. Et à l’arrivée, j’avais pourtant rentré tous mes waypoint, quand j’ai vu ce feu (qui était en fait le projecteur du bateau co mité) j’ai cru que c’était une cardinale et je me suis échoué. 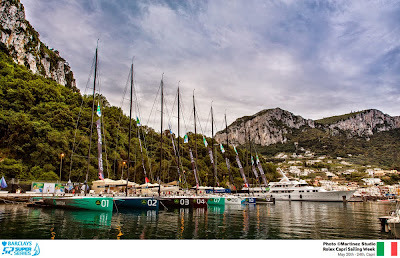 The leaders, Tony Langley’s Gladiator and Jim Swartz’s Vesper¸ were ghosting gently towards the windward mark off the rocky Faraglioni pinnacles at Capri’s SE corner - when the race committee announced their decision, based as much on the fact that there was no wind at all for their return into the Bay of Naples. After erring slightly to the west on the beat – in fact only a very small distance to windward - Azzurra, Paprec and B2 became separated from the fleet in a different breeze. At one point they were under gennakers pointing in the same direction. 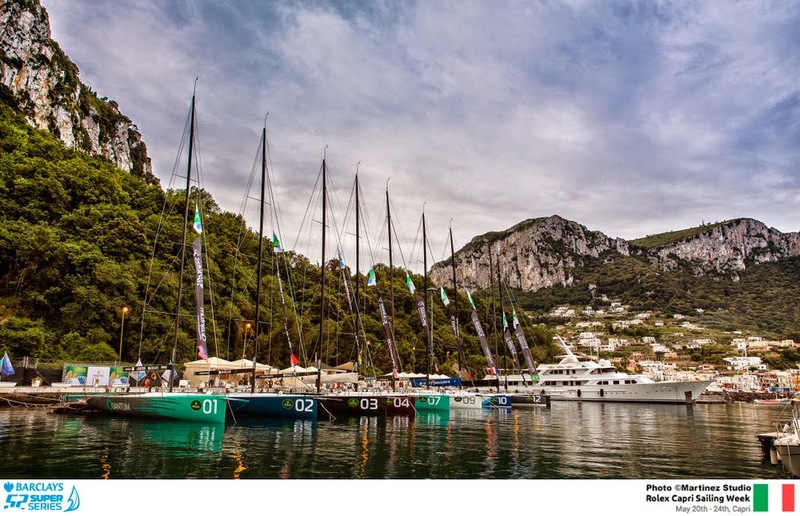 While the two Hungarian skippers, Nandor Fa and Marcell Goszleth (Spirit of Hungary), are in the middle of the Atlantic after a short stop which delayed them in Gibraltar (they should still arrive in New York around May 29 according to the latest routing) , preparations are being finalised for the four IMOCA 60s moored in the docks of "Newport Shipyard." Whilst Gaes Centros Auditivos, Neutrogena and Safran seem to be ready two days before the Prologue Race that will take them to New York, there is still some work to be done on board of Hugo Boss, following their dismasting after 11 days of sailing, just 400 miles from Newport ... but nothing that will prevent them from competing in the main race! “In the middle of the night we broke the mast above the second spreader but luckily we did not do much damage to the sails, that allowed us the next morning to set up a jury rig, with 3 reefs in the mainsail and a small sail at the front. We managed to reach Newport in just four days after the damage occurred," recalls Ryan Breymaier who is replacing Alex Thomson as co-Skipper. Alex’s wife will give birth to their second child during the IMOCA Ocean Masters New York to Barcelona Race. "Fortunately, the fact that we were in Newport to carry out the repairs was a real advantage because Newport Shipyard is used to dealing with such large boats. It is the ideal place to arrive with a broken mast as they have all the necessary skills! We took the mast out the same day as we arrived and found all the skills we needed by the next day. The only thing that slowed us down a bit was having to wait for the delivery of a vital piece - a broken piece of carbon cable at the second spreader , and that had to come from Sri Lanka. It should arrive tomorrow or the day after tomorrow. Apart from that, everything is ready to re-step the mast. Things will go quickly now, and although we will miss the prologue race, we will be ready for the start from New York, and we should re-join the fleet on the 27th of May, "concludes Ryan. 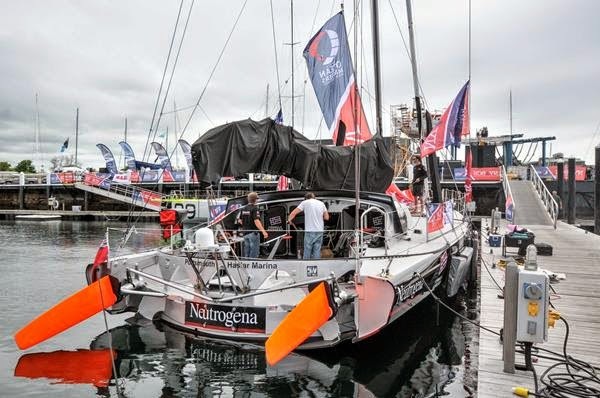 For Neutrogena, the trip was also a challenging one on the IMOCA 60 skippered by Spaniard Guillermo Altadill and the Chilean Jose Munoz but they avoided any technical issues. "Even though we crossed in very difficult conditions, with winds up to 55 knots, we looked after the boat, so as not to force anything and ultimately we did not break anything. We have a few matters to finish for the final preparations, mainly those which we did not have the time to deal with since the end of boat modification time back in March,” explained Spanish racing legend Guillermo Altadill, whilst he also praised the effectiveness of his shore team. 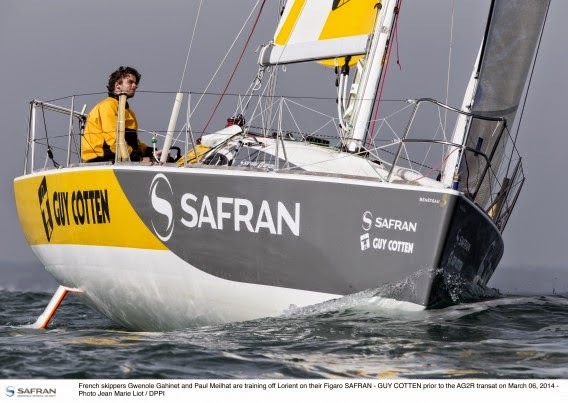 For Safran, the delivery trip also went well, actually really well according to the long time skipper Marc Guillemot. “It surpassed our expectations as we thought we would have to do more upwind sailing. We expected 80% of the trip would be into the wind but our decision to change our routing a bit more towards the south allowed us to do 80% of the trip with the wind behind us! We gained a whole day and a half by doing that, making the trip in only 11 days. And all that with a great atmosphere onboard. And it was the first transatlantic crossing for Morgan which allowed me to see how we would work together for the double-handed race from New York to Barcelona,” explained Marc. The ones who probably had the easiest trip were Anna Corbella and Gerard Marin. Onboard ‘Gaes Centros Auditivos’, they enjoyed relatively mild weather. "Even if we had to cross three weather fronts, they were not very strong and we we managed to navigate safely and to get to Newport with a small list of jobs. So now we just have to tweak a few things. Even the food is ready! We loaded the entire food supplies before leaving Barcelona so now we just have to add in some fresh produce. This allows us now to focus on the weather, the sailing instructions, the routing and details around the areas of departure and arrival for the prologue between Newport and New York," said Anna within 48 hours to go before the initial prologue event starts which will see the fleet reaching New York - the City of departure. Le skipper italien Giancarlo Pedote (Prysmian) est le grand vainqueur, en prototype, de la Mini en Mai. Il a bouclé ce long parcours entre Ouessant et l’île de Ré (au départ et à l’arrivée de la Trinité-sur-mer) avec environ 5h d’avance sur son dauphin, Jean-Baptiste Daramy (Eki Haizea) attendu vers 21h. En bateaux de série, Damien Cloarec (www.damien-cloarec.fr) est toujours en tête. Il est attendu vers 2h du matin. 51h de course pour parcourir les 336 milles de ce parcours d’Ouessant à Ré, en passant par Belle Ile et Yeu, dans des conditions très variées allant de 5 à plus de 40 nœuds de vent, avec des orages, de la mer... Giancarlo Pedote a largement mérité cette belle victoire, la 3e de la saison en 3 courses. Le skipper italien devance son dauphin d’environ 5 heures. Giancarlo Pedote (Prysmian) : « Le plus dur ça a été les derniers 50 milles, j'ai eu plus de 40 nœuds de vent ! J’avais 3 ris et le Solent, le bateau était couché tout le temps... J'ai dû tout affaler à un moment donné, mais bon je me disais toujours qu'il y en avait un qui pouvait attaquer derrière, alors j'ai remis de la toile. Mais c'était chaud. Ça a été super impressionnant aussi au large des côtes vendéennes, il y avait énormément de mer. Mais c’est un super parcours, c’est le même format de course qu’une étape de la Solitaire du Figaro, c’est super intéressant. Là, la météo était limite, mais c'est toujours intéressant de naviguer dans le gros temps. Je n'ai rien cassé, le bateau est bien préparé. 12 bateaux sont encore en course. Une belle bagarre est notamment à suivre en bateaux de série entre Damien Cloarec (www.damien-cloarec.fr) et ses poursuivants : Jonas Gerkens (Netwerk), Patrick Girod (Nescens) et Henry Marcelet (Yakamoz). 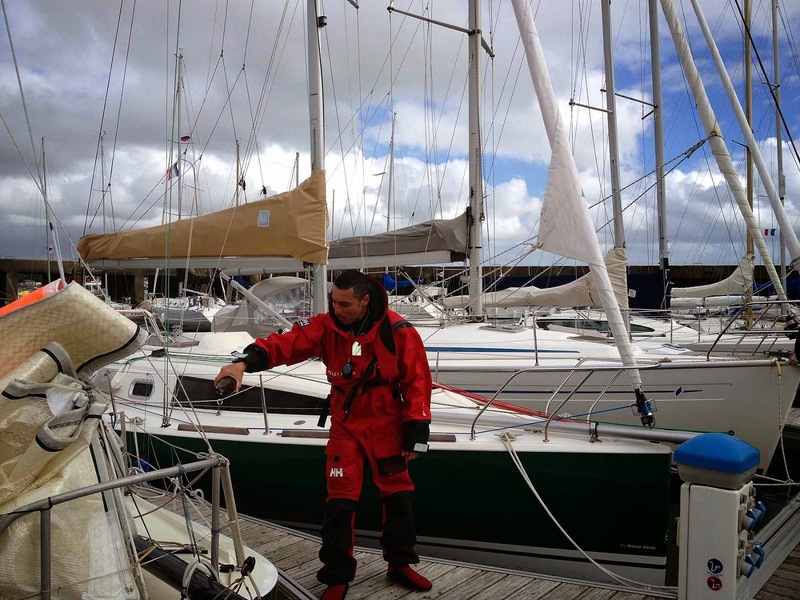 Les conditions de navigation sont encore dures… ces milles qualificatifs pour la course Les Sables-Les Açores-Les Sables, seront largement mérités. La météo corsée de cette première Mini en Mai marquera sans doute les esprits, les solitaires sont attendus toute la nuit de pied ferme par les bénévoles de la SNT ! 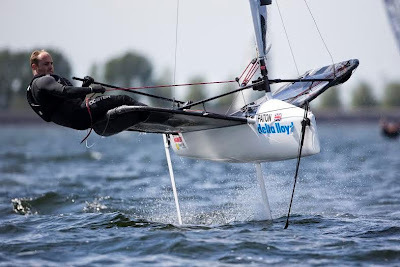 2014 Delta Lloyd Regatta rolled on in Medemblik today…. Sam Meech retains 2nd in the Laser with Andy Maloney in 3rd and Thomas Saunders in 5th. 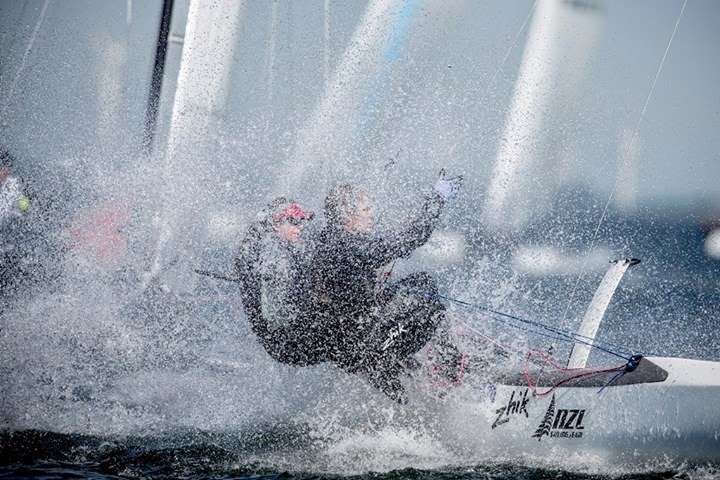 Love this action shot (above) of Gemma Jones and Jason Saunders in the Nacra who made big gains today. Forecasts of a significant drop in the wind in the afternoon were luckily wrong, and while the wind did decrease from the 15-18 knots in the morning there was still a healthy breeze late in the afternoon when the Moths were finishing their final race of the day. And the sun shone down on the 350 sailors from 49 nations all day long. It was a great day to be sailing. Megan Pascoe (GBR) had a perfect day in the 2.4 mR with two race wins. Michelle Broekhuizen and Marieke Jongens (NED) in the women's 470, Nicholas Heiner (NED) in the Laser, Marit Bouwmeester (NED) in the Laser Radial, Phillip Kasueske (GER) in the Finn, Zofia Klepacka (POL) in RS:X women, Alexandra Rickham and Niki Burrell (GBR) in the Skud 18 and Bruno Jourdren, Eric Flageul and Nicolas Vimont-Vicary (FRA) in the Sonar all maintained their leads. There were new leaders in the men's 470 with Onan Barreiros Rodriguez and Juan Curbelo Cabrera (ESP), in the 49er with Pavle Kostov and Petar Cupac (CRO), in the Nacra with Billy Besson and Marie Riou (FRA), in the RS:X men's with Louis Giard (FRA). Giulio Desiderato and Andrea Trani (ITA) also picked up a BFD to drop to third. The second race of the day was won by Asenathi Jim and Roger Hudson (RSA). Hudson said, “It was nice that we got some breezy conditions. It made a bit of a change and we enjoyed that. In the first race we had a good start and were in a great spot but we broke our vang, and had to fix that in the middle of the race and it cost us a lot, but we managed to get back to eighth. So that wasn’t too bad. Afrodite Kyranakou and Anneloes van Veen (NED) are still in second after a 6, 2 today. Kyranakou said, “It was a challenging day because the wind was shifting every two minutes, with many pressure differences. In the first race we had to come back at the start because we were over. And then we needed to catch up a lot. We didn't quite make top five, which is always our goal, but we were close. In the second race we had some speed problems, but we caught up with tactics and a good downwind to second, so that was good. We are happy with the week. Of course we are still making a lot of mistakes, so we want to improve a lot. You are never good enough. There is a new leader in the 49er fleet with Pavle Kostov and Petar Cupac (CRO) moving three points clear after another three races were sailed. Former leaders Erik Heil and Thomas Ploessel (GER) had a high score day, but only dropped to second while Dylan Fletcher and Alain Sign (GBR) fared better to move up to third. John Pink and Stuart Blithell (GBR) dominated the first two races with two bullets, while Frederico Alonso and Arturo Alonso (ESP) won the third race of the day. 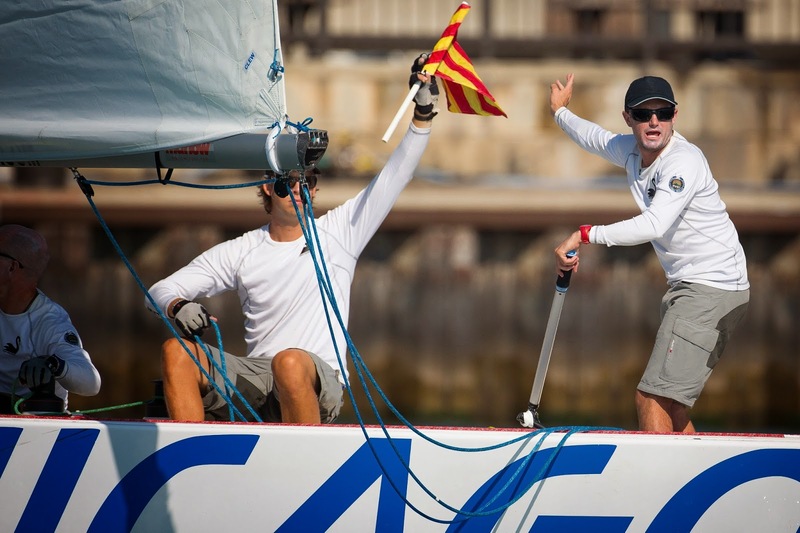 After winning the first race Przemyslaw Mirczynski (POL) slipped up with two mid fleet scores to drop to fifth. Louis Giard (FRA) had the best day with a 3, 5, 1 to move into a narrow lead over Dorian van Rijsselberghe (NED). The second race was won by third overall Piotr Myszka (POL). Zofia Klepacka (POL) solidified her overall lead with two race wins and a second place to take a six point lead after eight races. Malgorzata Bialecka (POL) won the third race of the day to move up to second overall while three top four positions keeps Lilian de Geus (NED) firmly still in the race, sandwiched between the four Polish sailors. The 35 Nacra sailors produced the expected spectacle with hulls flying, crashes and even a breakage as the mast on the boat of Lucy Macgregor and Andrew Walsh (GBR) came down after a capsize. Up to that point they had been having a great week. Despite posting a 3, 22, 10, Billy Besson and Marie Riou (FRA) moved into the overall lead, overtaking Franck Cammas and Sophie de Turckheim (FRA). Darren Bundocck and Nina Curtis (AUS) took a race win to stay in third. The other race wins went to Audrey Ogereau and Matthieu Vandame (FRA) and Flora Laugier and Valentin Bedllet (FRA). Phillip Kasueske (GER) maintains his overall lead with a 3, 4, though it is now down to a single point from Pieter-Jan Postma (NED). Jake Lilley (AUS) is now up to third, after he and Postma both picked up a first and second today in the stronger winds. Despite Oscar flag being displayed for free pumping on the downwinds, Postma picked up a yellow flag for having his boom in the water while pumping in the second race, which he admits probably cost him a second race win. Nicholas Heiner (NED) started the day by winning his third race of the week and then placed eighth in the second to end the day with a seven point lead. Sam Meech (NZL) is still proving to be the best of the chasing Kiwis, while Andy Malony (NZL) remains in third, though on equal points with the next two boats. Marit Bouwmeester (NED) continues to lead the Laser Radial fleet though she didn't have things all her own way. Alicia Cebrian Martinez de Lagos (ESP) remains in second with Evi van Acker (BEL) in third. The race wins went to fourth placed Isabella Bertold (CAN) and van Acker. After six races there is just five points separating the top three boats in the three man keel boat. Bruno Jourdren, Eric Flageul and Nicolas Vimont-Vicary (FRA) still lead from Colin Harrison, Jon Harris and Russell Boaden (AUS) and Aleksander Wang-Hansen, Marie Solberg and Per Eugen Kristiansen (NOR). Race wins went to the Norwegian and Australian teams. There is just one point in it in the Skud fleet after Marco Gualandris and Marta Zanetti (ITA) produced two bullets in the increased wind today, while regatta leaders Alexandra Rickham and Niki Burrell (GBR) picked up two second places. Vera Voorbach and Jan Rein van Essenveld (NED) remain in third, eight points adrift of the leaders. Megan Pascoe (GBR) looks to be running away with the 2.4mR class after two more race wins today, to extend her lead to eight points over Helena Lucas (GBR). Matt Bugg (AUS) is in third, another four points adrift. The Kite and the Moth were both began racing today as demonstration events at the Delta Lloyd Regatta. The 21 kites sailed a series of five or six person round robin heats through the day. After five sets of races, Oliver Bridge (GBR) is tied on points with Florian Gruber (GER), with Alejandro Climent Hernandez (ESP) just two points back in third. Chris Rashley (GBR) won three of the four races in the Moth fleet, with Ben Paton (GBR) picking up three second places and then a win in the final race. The British sailors made a top three with Tom Offer (GBR) finishing the day with a third place to move into third place overall. Racing for continues Friday at 10.00. ArMen Race : Ca se passera aussi a terre ! Mini en Mai : Ré, les voilà ! Volvo Ocean Race : We Love Sailing!